I am going to share with you WHY typical consequences don’t work and 5 ways that do work that build lasting change without power struggles and stress. Have you ever sat around with friends dreaming up consequences that fit your kid’s misbehaviour? So, maybe you start ranting with your friend, sharing your frustrations and dreaming up consequences that we think that will change our kid’s behaviour. Your child’s pushing your buttons, carrying on with the MISbehaviour, even after you have given a warning and you get angry and frustrated. And it is from here, a place where we feel we have lost our control, that we feel we need to exert our power OVER our child to get that power back. So we set a consequence…. A consequence that you feel that will fit their misbehaviour. One that would teach a lesson, but does it? 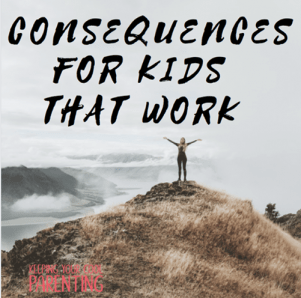 Consequences have become a go to parenting tool. Whether that’s a time-out or taking away a favourite toy or cancelling a play-date. For so many of us consequences are a thinly vailed punishment. And by the way, our kids know it! LET’S LOOK AT WHY THEY DON’T WORK. Imagine your partner comes home from work and has forgotten to buy the milk he promised he would. You wouldn’t shout and say “Well that’s it! You are just SO lazy. No T.V for you tonight, go to your room and you can’t have ice-cream for pudding. How dare you be so forgetful!!!!! It’s laughable really! What kind of reaction do you think you’d get from your partner?! Would it make them feel like helping you next time and would it start to erode your relationship? Even if you later discussed what would work better next time? Their defensiveness has gone up, your partner feels misunderstood, not listened to…. How would that help you learn how to drive the car more effectively? We just wouldn’t behave like this in normal life and use consequences to change someone else’s behaviour. It really is amazing how we talk SO differently to children. If we wouldn’t talk to an adult like that then why do we think it is affective for a child? LET’S NOW LOOK AT THE BREAKDOWN OF WHY IT DOESN’T WORK. We might stop the behaviour in the moment, but then what? Fear and control come at a high price to our relationship. Our true power is not in how many consequences we can dish out but the power of our connectiveness. Control can only get us so far. We tend to dish out consequences when we are at the end of our emotional rope. When we are in this place our kids seem like the enemy and it is from here we end up in power struggles and stress. You see, consequences are EXHAUSTING and damage your relationship with our child long-term. Here is my top 5 ways to consequences that work. If you are already using any of these tools with your kids, I would love to hear from you, please comment below.